The Sounders 2018 schedule came out this morning. And it definitely has some interesting angles to it. The 1st round of the Concacaf Champions League matches are the week before the MLS season starts. So you can travel down to Santa Tecla, El Salvador on Feb 22 for Leg 1, or just wait until Thursday, March 1 for Leg 2 at home. MLS Opening Day is Sunday, March 4 vs the newest entry into the league, Los Angeles FC. After that, you have to wait 27 days for the next home match, a 3/31 7:00pm tilt vs Montreal. If you’re ready for more soccer, grab your patience pants. It’s 22 more days before you get to see Minnesota United come for a day game on Sunday 4/22. So if you are counting at home, that’s just 3 home games in the first (and rainiest) 9 weeks of the season. That seems like a good deal for us fans. Things don’t get too much busier in May. Dates on the 5th vs Columbus and the 26th vs RSL is all we get. So we enter June with just 5 home matches under our belt. That means things start to get busy in June. 6/9 vs DC United, 6/23 vs Chicago and then the big one. 6/30 vs Portland. After a 3 week break, we really get into the meat of the home schedule in late July and August. Hope you didn’t have vacation plans. 7/21 vs Vancouver, 7/29 vs NYCFC, 8/12 vs Dallas, 8/18 vs Sigi and the Galaxy, 9/1 vs Sporting KC. That’s 5 home games in 7 weeks. As the kids head back to school, we close the season on a pretty regular cadence of home and away matches. 9/19 vs Philly, 9/29 vs Colorado, 10/6 vs Houston and the finale 10/28 vs San Jose. 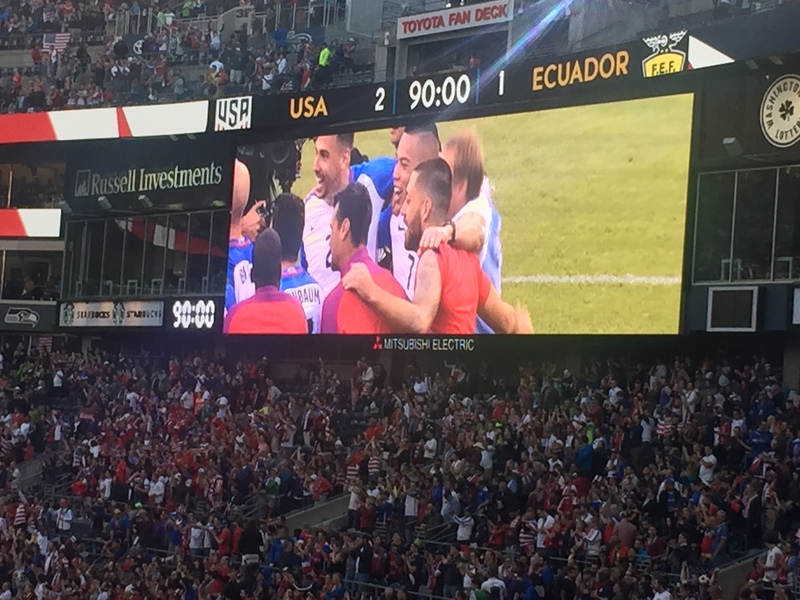 That’s 17 MLS home matches and one Concacaf match, with 14 of them coming in May – October. There will be more Concacaf matches, likely against a Mexican League squad, if they progress past El Salvador. So I suspect no friendlies will be officially scheduled until we see what happens in the Champions League. If you’re looking for good excuses to get out of Seattle, a couple of away matches stand out: Sunday 4/29 in LA is a good time to escape the rain. July 4 in Colorado could be a lot of fun. And July 15 in Atlanta would be a fun excuse to see their new stadium, especially since it’s indoors. I’ve long said that the Seattle Sounders do more smart things for their fans and supporters than any team I’ve ever run across. Last week, they held a small event, hosting a pub night at a local bar near the stadium. The bar features a 9 hole indoor putt-pitt course, and as luck would have it, I got to play mini-golf with Sounders CB Chad Marshall and LM Aaron Kovar. Both guys were great. Marshall was drinking a beer, and talking about golf and his 2 year old kid. Kovar is a friendly kid who looks like a guy you’d sit next to on a bus, going to his job at Amazon. My takeaway – whenever you see a goal scored from a free kick, especially if someone lost their mark, there was probably some sort of miscommunication between guys who speak different languages. I can only imagine what it must be like in Eurpoean leagues. The MLS season is a long one, running a full 9 months from early March to early December. So before the ink was even dry on the papers forever documenting the 2016 Sounders MLS Cup win, the wheels of progress were underway to form the 2017 version. Many of the players who played a decent sized role in the title run found themselves trading their Rave Green uniforms for flights back to their home countries. Meanwhile, a new set of Sounders filled out change of address forms, and made plans to move to Seattle. New Sounders are often guys we’ve never heard of. So, for these 8 new players, I’m sharing the 0-100 ratings the video game FIFA 2017 gives them. Check and make sure your favorite players are still here. Just 14 remain from the team that won in Toronto, but 9 of them started that night. Now I’m no math genius, but if you lose 18 players and add 8, you should still have some roster space available. In fact, an MLS team can carry 28 players on their roster at one time, so since the Sounders only have 22 on the current sheet, logic dictates you’ll see 4-6 more players either get signed from Sounders 2, or come in a late transfer window signing. The primary MLS transfer window runs from Feb 18 – May 11. Then, the secondary one opens from July 10 – August 9. So there you go; that’s your 2017 Sounders squad. See you at Century Link. It’s the end of an era. Quite literally. The Seattle Sounders have only known one head coach in all their days. Through 250 MLS matches, a host of playoff games and some lengthy runs through the U.S. Open Cup and Champions League, Sigi Schmid has been the only man driving the bus. And now that ride has ended. While Sigi was alone in compiling 115 wins, 69 losses and 66 draws from 2009-1016, the Seattle Mariners are now on a 5th manager to pull them out of their 573-660 streak. Sigi will get criticism for not winning the MLS Cup, a compliant that seemed to heat up after the Seahawks got their ring three Super Bowls ago. And the cry of, “Well we’re still an expansion team” fell on deaf ears as soon as the hatred Portland Timbers raised the cup ahead of the Sounders. At that point, the knives were out. But Is 2016 Sigi’s Fault? Forwards: Starters: Obafemi Martins, Dempsey, Valdez. Bench: Jordan Morris. Mids: Alonso, Evans, Ivanschitz. Bench: Kovar, Roldan, Friberg. Def: Mears, Torres, Marshall, Jones. Bench: Scott, Remick. Instead, Torres is hurt and Martins is sitting on a bench in China. Dempsey missed a month on National team duty. The Sounders were trotting out a lineup of role players and hoping Jordan Morris could dramatically exceed any reasonable expectation of a rookie. Evans got shoved back to defense and couldn’t contribute on offense. When Dempsey was here, he had no one to pass to. The team was so slow that defenses could push high up the field and pressure guys like Scott into turning it over in front of goal. A lot of things went wrong this year, and I’m not sure if any coach could make that lineup work. The Sigi detractors have a fair point – that with the players we ended up with, he stubbornly stuck to a formation that didn’t seem to fit them. It’s really a double edged sword. If he was switching formations every few games (the way we all would playing FIFA on XBox) and it didn’t work, we’d be yelling about that. And so that leaves Sounderland in a little bit of a quandary. Sigi was “our guy” from the get go. Adrian is “our guy.” GM Garth Lagerway is a Real Salt Lake guy. “Our guy” took a fall because the coaching staff and management team couldn’t get results in 2016 with the product they put together. Now we have to trust in Lagerway to find the right players and the right coach. I’ll miss Sigi. I’ll miss wondering how a guy who spends every day on a soccer field and eating meals specially prepared by a scientific driven training team could possibly weigh in at 3 bills. I’ll miss standing behind the bench trying to figure out what crazy substitution is coming next. But this is a reminder that nothing lasts forever. The storybook start to the Sounders franchise, with Sigi leading us to a 3-1 win over New York, still hasn’t had the magical payoff moment we’ve been waiting for. I hope it comes soon enough that Schmid’s fingerprints are still on the team. I hope we get to see Brad Evans and Ozzie Alonso lift a cup and we can remember Sigi’s original influence. So long sir. I feel lucky that we had you take the reins at the beginning and lead us to where we are today. Best of luck in whatever challenge you take on next. A few quick takeaways from what was a pretty cool tournament. Sure, the Germans have technical skill that is fun to watch. But if you gave me the choice to randomly select two South American teams or two European teams to watch play, I’d choose the South Americans every time. With the exception of Bolivia, who played a 4-4-1 with their 11th guy being Messi’s shadow, the South American teams came out attacking. The irony is that they can do so because the good ones have such strong defenses that they can send an extra guy forward. As much as I love the Iceland story, even they play 10 guys deep and hope to get lucky on a long throw or corner kick. 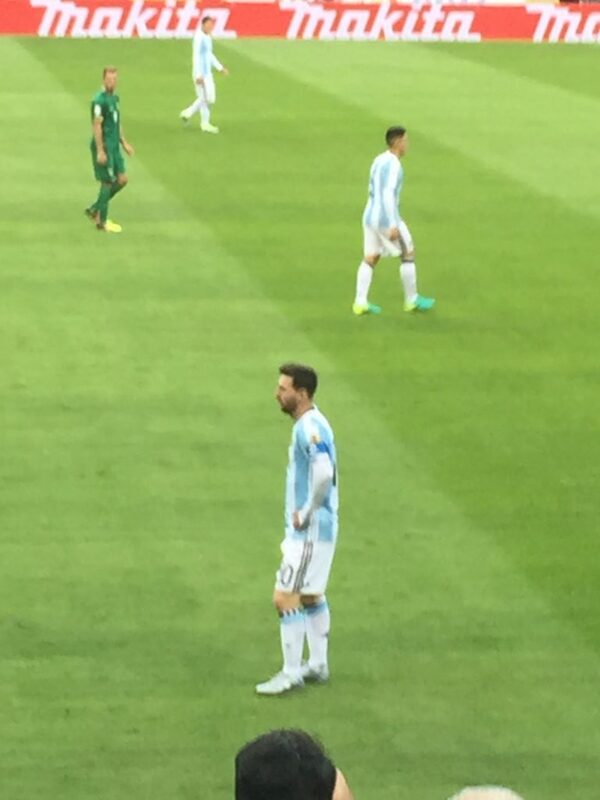 Chile’s defense must be fantastic, because I don’t know how they shut Argentina down. Granted, when I saw them live they were facing an overmatched Bolivian team, but I think the result would have been the same against Venezuela, Peru, Ecuador or Columbia. They are so technically proficient with the ball, and can deliver pin-point passes from anywhere on the field. Their fullbacks are giants who can dribble and pass as well as U.S. forwards. Even their little guys are strong. And their 1st touch always seems to be placed in a direction that is away from a defender. You didn’t have to understand soccer to appreciate what they can do. Great tournament, yes. But tickets were so expensive, that it turned into something I would like to attend and see once every 8-12 years or so. It was a shame that they priced families out of the market. I wouldn’t have dropped $600 to bring a family of 4 to see Peru vs Haiti. In a world where variable pricing is so easy to implement, I think they dropped the ball for the sake of trying to get as much up front cash as possible, since they forced you to buy tickets before the schedule came out. Then, they only sold tickets on one side of the stadium, so on TV it looked like there were more people in attendance. The U.S. benefited by Brazil and Uruguay not really showing for Copa America, and that probably lifted them from a loss in the round of 8 to a semi-final shot against a much superior Argentina squad. If they were in the Euros instead, I could probably name 6-8 teams who the U.S. should lose to, 6-8 they should beat, and a few that they’d probably just go 0-0 with. We have some good young speed and a decent defense, but no go-to scorer. If you are going to go into a tournament with those attributes, you can’t make mistakes – like handballs in the box, needlessly accumulating useless yellow cards or lashing out for stupid reds. If there’s one thing I can blame a coach for, it’s a lack of player discipline. Those careless mistakes need to get hammered out of players if you want to beat a team from Pot 1 or Pot 2 in a 2018 World Cup Match. 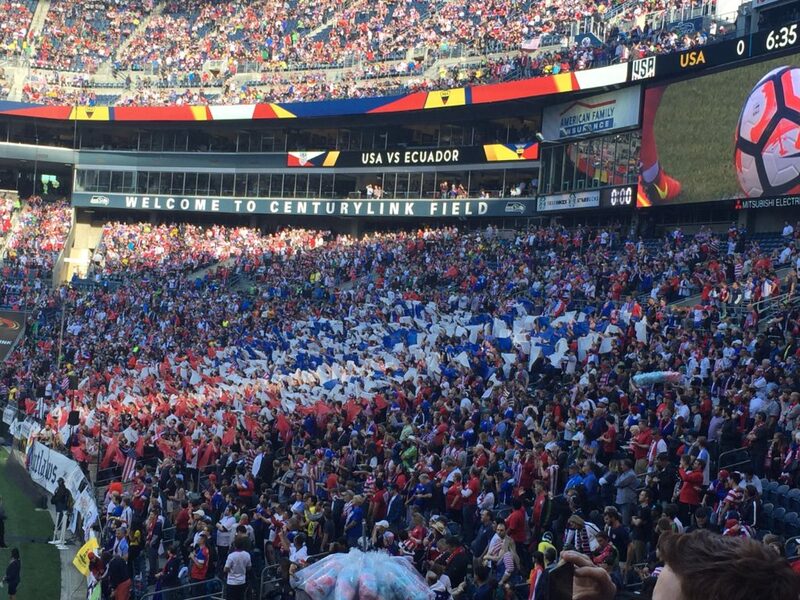 The costumes, the flags, the cheers – the U.S. game had a fantastic atmosphere about it. Maybe it was because we were playing at home, but I’m glad we have joyous and positive fans, not thugs and brutes. The Sounders play their 1st game of the MLS season on March 6. But today is February 23 and they have a home game that matters against a Mexican team called Club America. For you non-soccer fans, I will attempt to explain in the fewest words possible. 2) In 2015, they played the “Group Stage,” where the 24 teams were split into 8 groups of 3, with the winner of each advancing to the next round. 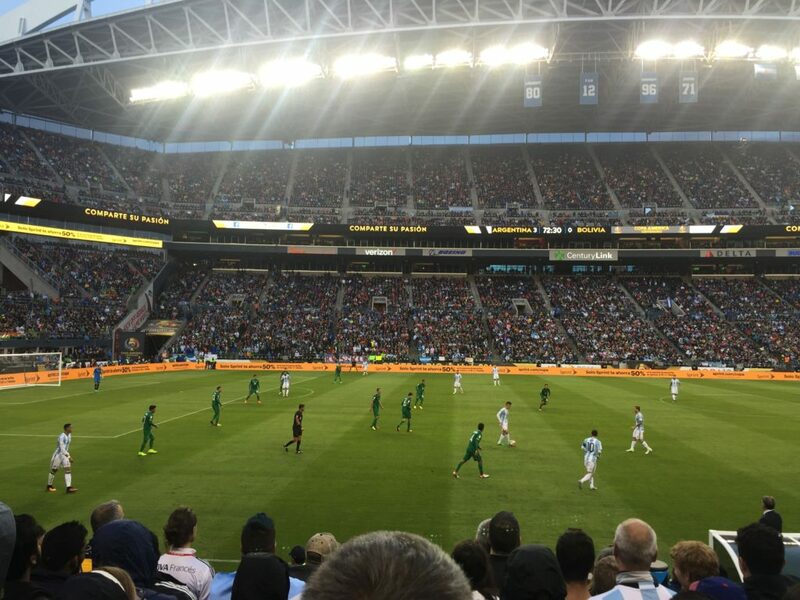 So the Sounders played 2 games against a team from Canada and 2 games against a team from Honduras. They won their Group, thus advancing to the final round of 8. 3) HOWEVER, due to the weird schedules of U.S. and Mexican leagues, you can’t actually play the quarterfinals, semi-finals and finals of the 2015 tournament in 2015. So these rounds are being played in February, March and April of 2016. In each round, the teams will play two games against their opponent, one at home, one on the road a week later. Most goals after two games wins. 4) Out of the 24 teams that qualified for the tournament originally, 4 were from the Mexican League and 4 were from the U.S. The other 16 came from all over Central America; Honduras, Trinidad, Guatemala, etc… All 4 teams from Mexico and all 4 teams from the U.S. advanced to the final round of 8. So if you are a math wizard, you are able to quickly see than ZERO of the 16 teams from the other countries made it past the U.S. and Mexican teams. In fact, when you look at the overall records in the Group Stage, U.S. teams were 10-5-1 and Mexican teams 10-4-2. Yes, in 32 games, U.S. and Mexican teams lost a total of 3 times. Adding to the lunacy of the whole thing, because each group has 3 teams, by mathematical definition all the teams in the groups can’t play in the same 24 hours, like every other tournament in the world would schedule games. So in a quirk of fate, last year the Sounders won their group BEFORE the other two teams in their group had played their final game. Thus, Vancouver had to fly to Honduras in the middle of the week to play a game that didn’t matter, wasn’t on TV and no one wanted to go to. I think they sent like 13 of their youngsters and were in and out in 24 hours. So that’s why the Sounders are playing tonight. The U.S. Men’s National Team starts its World Cup Qualifying run vs St Vincent and the Grenadines tonight. Who the heck is the the St Vincent and the Grenadines soccer team? Well, here are some fun facts. 1) The island is here. 2) The country has 109,373 people. That is approximately 321,905,480 less people than there are in the U.S. For perspective, the United States has 4,186,778 registered soccer players. 3) Assuming the team has a standard 23 players, .021% of the country’s population is on the National team, or 1 out of every 4,750 people. 4) The team is ranked #129 in the world. That’s actually better than Luxembourg (146), New Zealand (159) and India (172). 5) There is an actual St Vincent and the Grenadines Professional Soccer League. It features the Toni Store Jugglers, Prospect United, Avenues United, Fitz Hughes Predators, JG & Sons Stingers, Camdonia Chelsea, System 3, Zodiac Football Club, Nemwil Hope International, Digicel Jebelle, Besco Pastures and K&R Strikers. 6) Two members of the St Vincent and the Grenadines Soccer Team, Myron Samuel and Oalex Anderson, play for Sounders FC 2. Put that in this perspective – the man with the most games played and most goals scored for this country, plays on the minor league version of the Sounders. If Oneil Fisher was from SVG, he could be a starter. 7) In the qualifying round for the 2014 World Cup, they were eliminated in the 2nd round, going 1-2-3 vs Guatemala, Belize and Grenada. 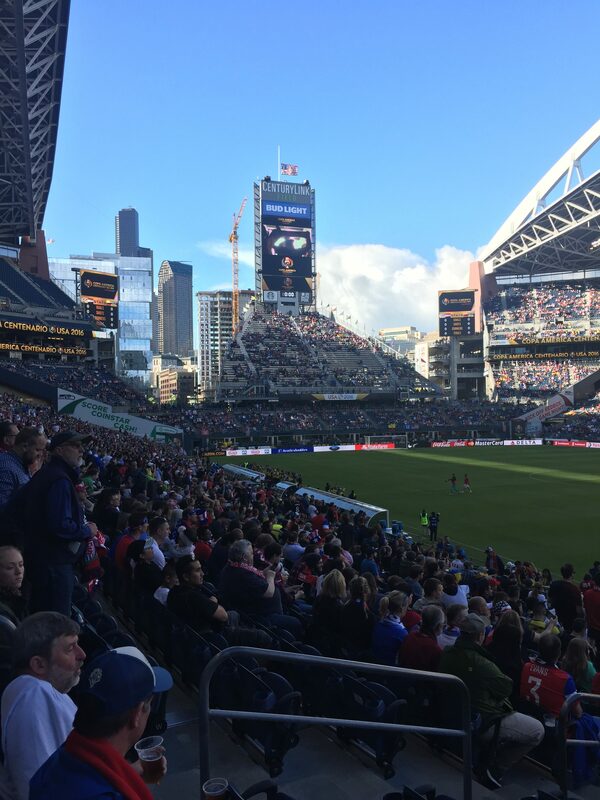 Did the MLS Playoff System Work, to the Detriment of the Sounders? This may be a stretch.. but I think the MLS playoff structure did its job in the Sounders vs FC Dallas series. – The Sounders had to field the best 11 they had for the last game of the season vs RSL, to ensure they made the playoffs. – By finishing 4th, they then had to play again that Wednesday in a winner take all match vs LA Galaxy, so they had to field their best 11 again on 2 days rest, or rest a couple of guys and take their chances. – Predictably, as an older team, this led to small injuries that over the course of a season would be recoverable, but in the case of the playoffs, was not. – So Dallas, already built younger, goes into the series with 7 days rest vs our 3. We got the win in game 1, but we were clearly taxed at the end. – Now we roll Oba and Dempsey out again for game 2. That’s Game #4 in 14 days for these guys. I think our 30+ year olds at the end of a 40 game season were simply tired vs a bunch of 25 year olds who had one less game to play. – Thus, the system worked. Dallas was rewarded for having a better record. And that slight edge got them to the next round. Why do we split young soccer players by gender? Saturday morning, shortly after my friend Trevor and I had completely our lap around Greenback – at a blistering pace I might add – you could find us relaxing on the deck of our favorite coffee shop, Forza. There, we had the perfect view as parents and 5-8 year olds invaded the soccer fields and set up for their matches. The games started and we watched with amusement as goalies who would eventually fit into their jersey 5 years from now whiffed on punts, entire packs of kids followed the ball around the field en masse, and 12 year olds ruled the field as referees. Yes, I understand that there’s an age where each gender’s bodies start developing at different paces and it makes sense to separate them. But at the very earliest ages, why not instill in kids that being good at what you do has nothing to do with gender? I have no answer here. Just curious.